Contemporary style with all the comfort for taking it easy make this rocker recliner a welcome addition to your home's living room or family room. Curved contemporary arms with plush cushioned pillow arms, chaise pad seating, and a thick bustle back surround you in comfort. 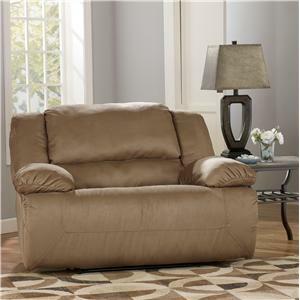 With DuraBlend/Match upholstery makes this great looking recliner an affordable piece. 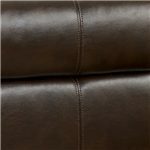 The arm chair features DuraBlend bonded leather upholstery in the seating areas with skillfully matched Polyurethane everywhere else. 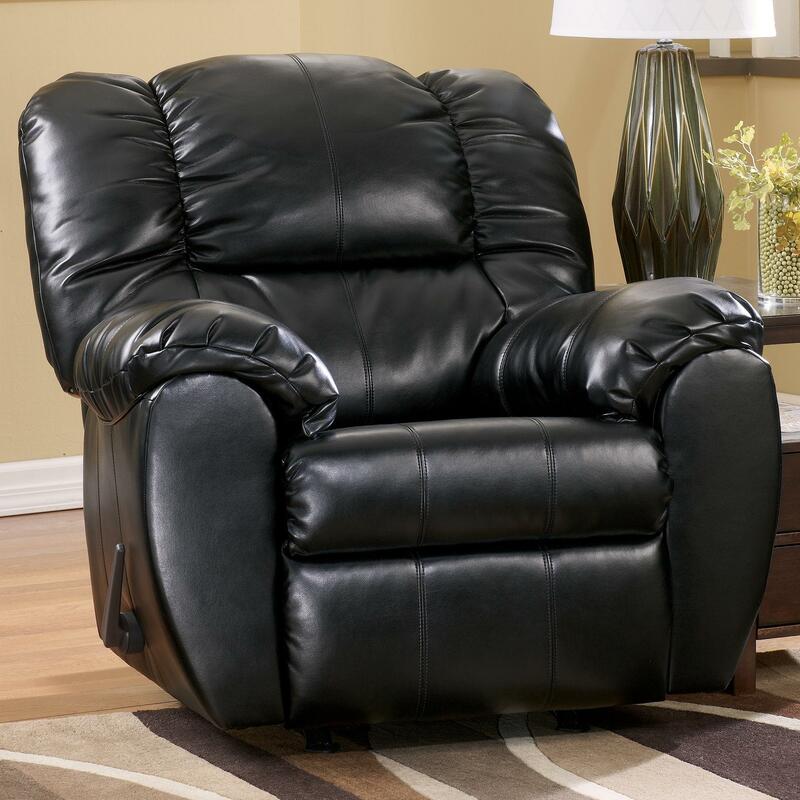 Sit back and relax in this recliner as you watch TV, hang out, or browse the web with a laptop. Floor to top of footrest: 21"
Space b/w recliner and wall: 12"
The Dylan DuraBlend - Onyx Bonded Leather Match Rocker Recliner by Signature Design by Ashley at A1 Furniture & Mattress in the Madison, WI area. Product availability may vary. Contact us for the most current availability on this product. Padding & Ergonomics Cushion cores are constructed of low melt fiber wrapped over high quality foam. Fully Upholstered seats feature cushion cores that are low melt fiber wrapped and 1.8 density. I needed something cheap, and this was. But just know that the Durablend fake leather is good for about maybe 2 years and then it fails. Just google Durablend complaints. So now a year later I'm shopping for a recliner and the other one is at the curb,PEELING AND TORN. I would never buy this chair again, there are 5 tears in the chair haven't had it two years. Within a year a tear in the head area. 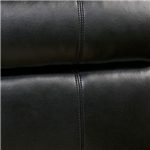 Purchased 2 of these recliners about 4 years ago...should have spent the extra $$ to get REAL leather. This durabond was fine for the first year but now the arms are cracked and pulling apart from the chairs. Looks CHEAP. If you want to replace your recliners every few years this is the recliner for you.